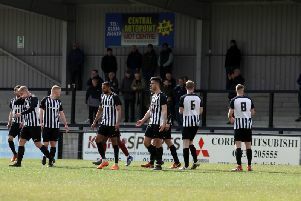 Corby Town have suffered a blow after it was confirmed that summer signing Lee Stevenson has retired from playing. Steelmen boss David Bell revealed the former King’s Lynn Town midfielder has been offered a job that will prevent him from playing on Saturdays. Bell is now hoping to make a swift move to replace the 33-year-old with a familiar face in the form of Steven Leslie who played and scored in last Friday’s 5-0 victory over Stewarts & Lloyds at Steel Park. “Lee has had to retire from playing,” the Steelmen manager, who is still keen to sign veteran goalkeeper Paul Bastock, said. “He came to me and said an opportunity had come up for him for a new job, which would mean he wouldn’t be able to play much on Saturdays. “He is 33 and he has to think about his future, I am glad he came to me and was honest and we wish him well. “It has left a bit of a gap but it was good to have Steven involved again on Friday. “I think everyone saw last season that he has quality but he had a hamstring injury which held him back a bit. Bell, meanwhile, was pleased with what he saw from his team in their latest outing. The Steelmen are back in pre-season action at Cogenhoe United tomorrow (Tuesday) night and Bell added: “It was another good workout for us.